This top floor loft in the Campus Lofts building at The Lofts at Albuquerque High has an east-facing balcony with stunning views of the Sandia Mountains and surrounding neighborhood, The loft features wood floors, high ceilings, a large open living/kitchen area with Italian Laminate cabinetry, and divided bedroom area with closet and a full bath. A utility closet has a stacked washer/dryer and storage space. Elevator in building. Access to beautifully landscaped secure courtyard featuring fountains, seating and grill. 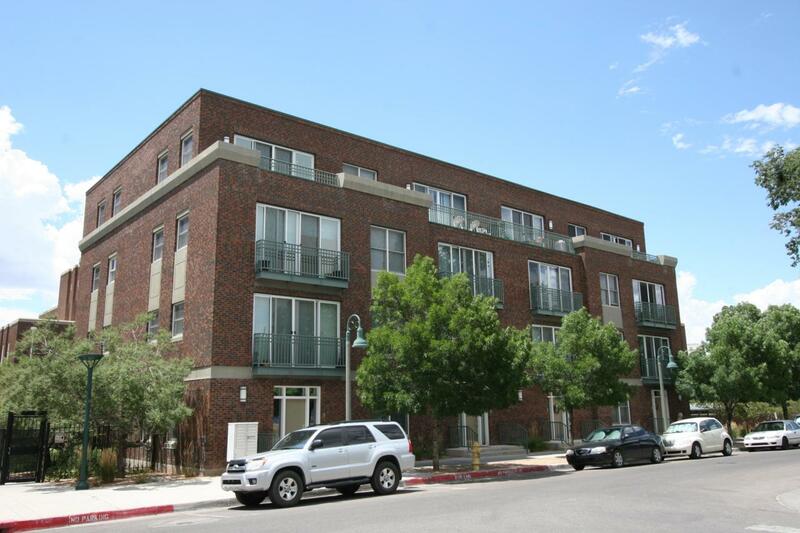 Located in EDo with close access to award-winning locally owned neighborhood restaurants, salons, dry cleaner, yoga studios, Innovate ABQ's UNM Rainforest building and ART. Close to airport, UNM, I-25/I-40, Railrunner. City-garage parking at 100 Arno, $40/month. Listing courtesy of Edo Spaces, Llc. © 2019 Southwest Multiple Listing Service, Inc.
IDX information © 2019 The Southwest Multiple Listing Service, Inc. IDX information is provided exclusively for consumers' personal, non-commercial use and may not be used for any purpose other than to identify prospective properties consumers may be interested in purchasing. Data is deemed reliable but is not guaranteed accurate by The Southwest Multiple Listing Service or Campbell & Campbell Real Estate Services. Data last updated: 2019-04-23T21:05:36.84.